Note: Always call our Friendswood dental office (281 482 2631) to contact Dr. Sierra if you have any concern that needs to be addressed immediately. Lost fillings, crowns, & bridges. This is usually a minor problem that rarely causes more than slight sensitivity, and can most often wait until regular office hours. Lost crowns and bridges can often be temporarily replaced over their original tooth. If you are going to be unable to have an office visit for a few days, try placing a small amount of denture adhesive (Fixodent) in the crown to hold it in place. Lost or loose provisional/temporary crowns and bridges. Again, usually a minor problem. Generally no harm will be done to the prepared tooth which may however, be very sensitive. We do prefer that the provisional crown be recemented to preserve the special relationships with the surrounding teeth. Toothache. 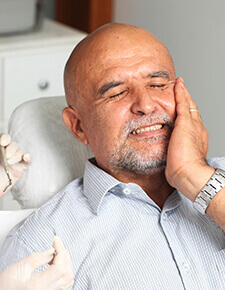 A persistent toothache is generally a sign of a serious problem with a tooth, and may just be developing. A good test is how the discomfort responds to over the counter pain medication. If after plain Tylenol, Aleve, or Advil is taken, the tooth feels better, then the problem should hold until regular office hours. More persistent pain may mean an infection or a problem that needs immediate attention. You should never place any medication in the tooth or on the gums yourself, especially aspirin. Gum infections. Generalized gum bleeding and soreness can generally wait until a regular office visit can be scheduled. A sudden soreness and bleeding between teeth is often caused by food impaction. Try flossing and vigorous rinsing. If food is dislodged the area should feel better fast, but it should be checked in our office as soon as convenient. More serious swelling or a “gum boil” is often the sign of a more involved infection that will require antibiotics and attention. Major head injury. Any major or serious blow to the head or face should be treated immediately and usually in a hospital emergency room. Often, immediate concern for concussions and other brain trauma outweighs even serious dental injury. Lacerations of the lips and gums. The mouth tissues are very fragile and tear easily, requiring sutures. Unsutured cuts and tears often result in ugly scars and lumps. Lacerations usually warrant at least a phone call to our doctors. Avulsed (knocked out) teeth. If you are certain that a primary (baby) tooth is involved this is usually not a serious problem because often the tooth is already loose because of age. However, even when a complete baby tooth is knocked out at an early age, we do not attempt to reimplant them. Permanent teeth knocked out should be placed in milk or water immediately and go directly to our office or if you are out of the area, any dental office. Call our answering service after hours so that we can advise you no matter where you may be. Reimplantation enjoys a fairly high success rate if done quickly. Broken or chipped teeth. First, attempt to determine if the tooth is a permanent or primary (baby) tooth. Both situations are rarely serious unless the tooth is loose or the pulp is exposed. Baby teeth near the time of normal loss are frequently chipped and knocked loose. This is not usually something to be treated immediately unless the tooth is severely loose. Broken teeth will almost always be sensitive but will wait until regular office hours unless the pulp (nerve) is exposed. A visible area of bleeding coming from inside the tooth usually determines this. Pulp exposures usually need immediate attention. Please note that this list does not begin to cover all the possible dental emergencies, just the most common. If you have a dental problem that needs attention, or is causing you concern, please contact our emergency dentist near League City or answering service by dialing (281) 482-2631.